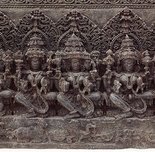 In Puranic literature, the Seven Mothers (Saptamatrikas) emerge to aid Shiva in his battle against the formidable demon, Andhaka. According to the legend, Shiva strikes Andhaka; but with each drop of blood that falls from the wound, a replica of the demon arises. Seeing Shiva faced with thousands of Andhakas, the other male gods send their ‘shaktis’, in the form of the Seven Mothers, to stop the blood from falling to the ground and prevent the multiplication. With the help of the ‘matrikas’, Shiva overcomes his foe. In the famed ‘Devi Mahatmya’, the Saptamatrikas again perform a similar function and help Durga vanquish the demon Raktabija (see cat. 67). The stele shows Shiva, seated on the far left, accompanied by the Seven Mothers. From left to right, the goddesses are Brahmani, who emerges from the god Brahma; Maheshvari, who emanates from Shiva; Kaumari, the counterpart of the warrior god, Kumara; Vaishnavi, the female energy of Vishnu; Varahi, the partner of Varaha, the boar incarnation of Vishnu; Indrani, the ‘shakti’ of Indra; and the fierce, skeletal personification of energy, Chamunda. 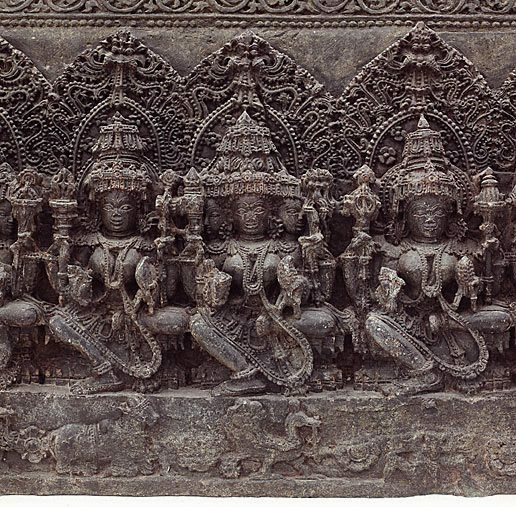 The panel’s intricate carving and richly embellished figures are stylistically typical of Hoysala period sculpture. Chaya Chandrasekhar, ‘Goddess: divine energy’, AGNSW 2006, pg.108. 40.5 x 98.0 x 18.5 cm; 126.5 kg. Bruce James, Art Gallery of New South Wales handbook , 'Asian Collection: South Asia', pg. 288-297, Sydney, 1999, 290 (colour illus.). Jackie Menzies, AGNSW Collections , 'Asian Art - India, South-East Asia, China, Tibet, Korea, Japan', pg. 173-228, Sydney, 1994, 177 (colour illus.). Jacqueline Menzies, Art Gallery of New South Wales handbook , 'Asian', pg. 72-93, Sydney, 1988, 88, 90 (illus.). The Asian Collections Art Gallery of New South Wales , 'The Realm of the Hindu Gods', Sydney, 2003, 20-21 (colour illus.). The colour illus. on page 21 is a detail of this work. Hindu goddesses: visions of the divine feminine in the Hindu religious tradition , 'Chapter 10: The Matrkas - The early history of the Matrkas', pg 151-160, Berkeley, 1987, 151-160.